There was a grid theme at Gabriele Colangelo, from the check pattern print used to the shape and structure of the clothes themselves. Clothes were skewed and deconstructed: skirts were folded and pleated and had strips hanging off shoulders or waists. Collars and lapels had a block-like geometric feel and the draped, wide lapels echoed the blocky form. Colangelo showed high-waisted trousers and cropped tops. Zig-zag overstitching was left frayed and trailing and provided an interesting contrast to the sober colours. There were a lot of sporty looks on the runways of Milan. Ermano Scervino started with masculine suiting but made sure to balance this with feminine dresses made of Chantilly and Valenciennes lace. Later on, he showed a mix of athletic-inspired pieces elevated by luxurious touches such as an anorak with striped mink sleeves and plunging v-necked gowns cinched by woven mesh belts. A breathtakingly beautiful collection from Roberto Cavalli and one with a level of sophistication and paired back glamour that isn't usually associated with the house. More commonly known for its exuberantly European aesthetic, here Cavalli's in-house team showed floor-length embellished gowns or trousers. Often paired with bustiers, the clothes were adorned with crystals and Ostrich feathers that gave the collection more of a couture than a ready-to-wear feel. The silhouette was narrow and most looks were belted to accentuate the waist. Short fur jackets added texture and glamour. There was the expected use of animal print found either subtly as in the printed chiffon of the gowns, or the in-your-face expressionism of the short fur coats. In addition to the floor-grazing lengths of the gowns and tailored trousers, there were a few shorter pieces made to resemble animal skin. Despite not having a creative director at the moment with the departure of Peter Dundas, the collection was still covetable. 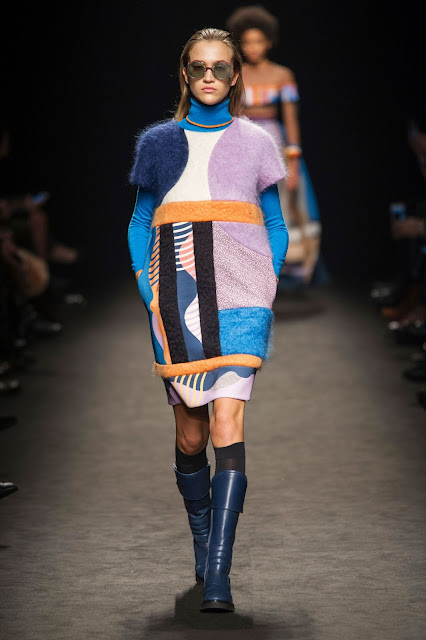 For designer Manuel Facchini, it was all about colour and geometry at Byblos. There were leather bomber jackets with fur sleeves, mohair coats, scarves and snoods paired with gowns, oversized textured cardigans and micro-pleating on dresses and skirts. The geometric lines of Mondrian-esque blocks of primary colours and circles followed the contours of the body, while ribbons of colour added movement and texture. 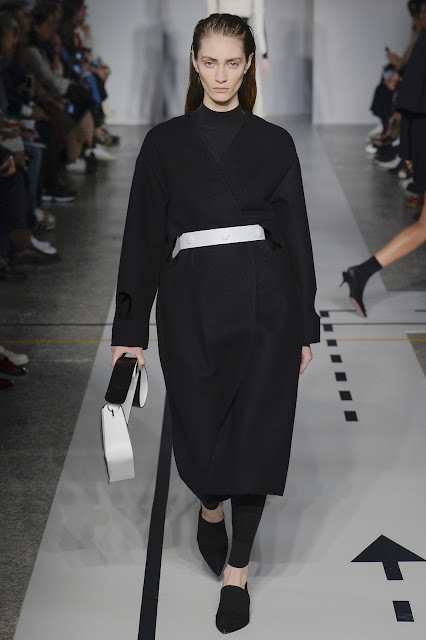 A black and white collection from Max Mara's diffusion label Sportmax. Always geared toward a more athletic aesthetic, the line continued to embrace the athleisure trend by showing parkas, leggings, silk parachute dresses, oversized knits and quilted sweatshirts. In a clever touch, clothes were fastened by carabiners or double zippers that ran their length from throat to hem. Some pieces were emblazoned with the word 'Run' or 'Ready, Steady, Run' compelling the wearer to action. Fendi opened with a grey herringbone double-breasted coat in Prince of Wales check with deep mink cuffs on bracelet-length sleeves and this mix of sturdy serviceability and luxury set the scene for the rest of the collection. 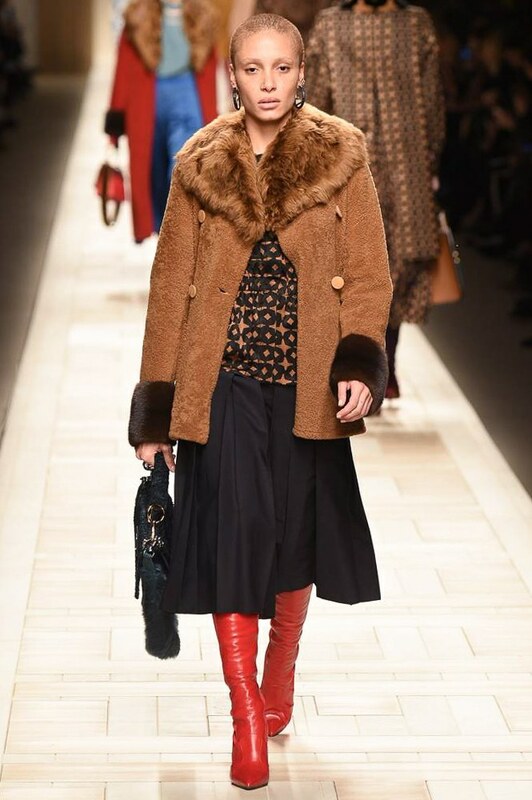 Karl Lagerfeld's clothes - bias-cut midi dresses and skirts, cuffed trousers and enviable outerwear - were mainly black and camel with pops of blue and a unifying red that came from the models' tall leather boots. A repeating geometric pattern added interest to coats and dresses while '1925', the year the house was founded, appeared in Roman numerals on belts and cuffs. 1950s beach culture met collegiate styles at No. 21. The inspiration for the season came from the movie star Anna Magnani and saw herringbone suiting, pencil skirts, varsity jackets, sweaters and a fair smattering of Swarovski crystals. A fun, lighthearted collection from Les Copains' designer Stefania Bandiera that had a school uniform vibe. Patches of heraldry, coats of arms and mythical griffins adorned jackets, coats and jumpers. She paired extra-long scarves and chunky knits with leather bustiers, sheer skirts and wide-legged trousers. 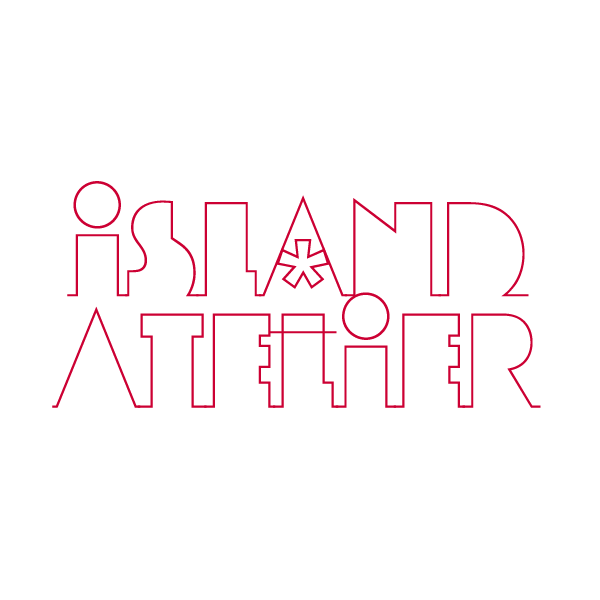 Often designers' inspirations can be vague and difficult to parse. Not so with this collection from Francesco Scognamiglio who took the butterfly as a starting, middle and end point for his designs. Silk jacquard dresses were as gossamer as a butterfly. The delicate patterns of the insect's wings turned up as bilaterally symmetrical prints and velvet dresses featured wing-shaped cutouts. Even the shaggy coats appeared to be a direct reference to the insect's thorax. Overtly literal and simplistic perhaps but nonetheless it was a beautiful collection. Over in Milan, we find a pretty, opulent collection from Alberta Ferretti who used the city of Venice as her muse. The winged lion from the Piazza San Marco worked in gorgeous gold embroidery took pride of place (no pun intended) on gowns, coats and sweaters while the Grand Canal and the city's bridges turned up in print. Models wore frilled caplets or full-length feathered capes and masks in honour of Carnevale which will be celebrated next week. Gondolier's stripes adorned gowns at a diagonal and corsages were affixed to necks, shoulders and waists. Several models wore a version of the cappella romano a wide, circular brimmed hat with a rounded crown, the severity of which were a nice contrast to the feminine clothes. 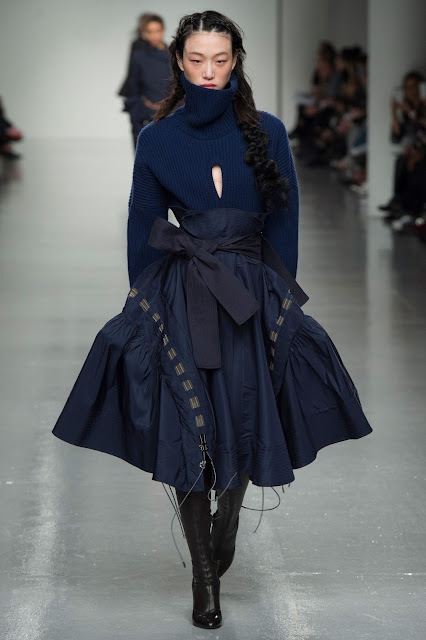 Let's close our look at London Fashion Week with a review of this modern, streamlined collection from J JS Lee that featured an elongated silhouette and rounded shoulders. The clothes were utilitarian: wide bands bisected the the chest and waist while dresses had drawstring hems and button down shirts and trousers had exaggerated cuffs. Thick "cravats" knotted around necks and used to fasten jackets added some interest. There was so much on the runways of New York and London that left us... underwhelmed, but this collection from A.W.A.K.E., which was released near the end of London Fashion Week, went some way toward remedying those feelings and, like its name, perked us right up. A.W.A.K.E. 's presentation consisted of well-made and interesting clothes from designer Natalia Alaverdian who was inspired by, of all animals, the octopus. The impeccably tailored pieces included slit, flared trousers, padded coats, jackets and dresses - some with distressed and unfinished hems - and ties or toggles for fasteners. The proportions were elongated in many cases with statement sleeves and trouser legs taking the place of tentacles. A Japanese influence was also evident from the octopus woodcut print lining a coat to the kimono-esque tunics and obi belts. We usually prefer Victoria Beckham's diffusion line to the main one that's shown in New York and this season was no exception. 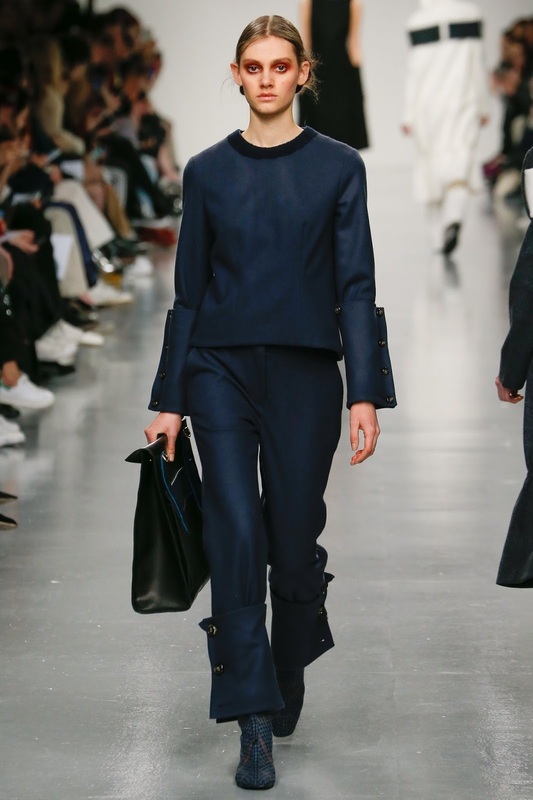 For Victoria, Victoria Beckham, the clothes featured a relaxed, oversized silhouette which reflects Beckham's own personal evolution from body-conscious, overtly sexual clothing to something quieter and more sophisticated. 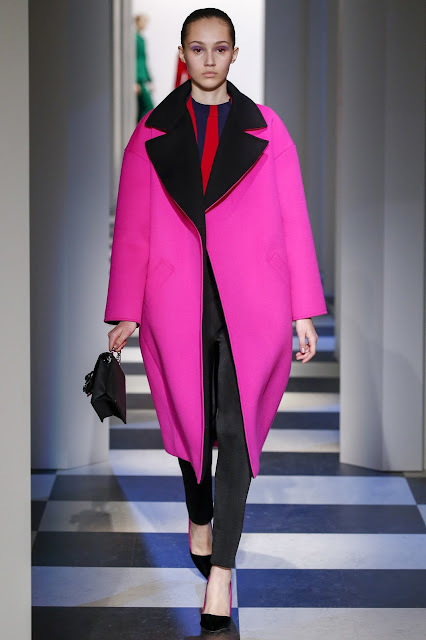 From cozy knits and coats, extended sleeves and necks and an abstracted portrait sweater there was a lot to love. Creative director Christopher Bailey moves away Burberry's traditional focus on outwear with this collection. Featuring both mens- and womenswear, the large collection of more than 70 pieces was a distinct departure from the House's usual offerings. As expected there were a few trench coats, but their lines were softer and less structured than before. 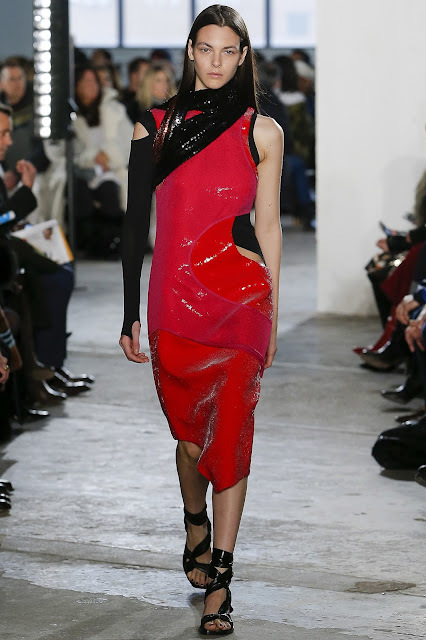 The main focus of the collection was on the combination of textures and textiles in unconventional ways. This included the beautiful lace that adorned dresses, jumpsuits and shirts for both men and women, the asymmetrical cable knit sweaters that were layered over lace or striped dresses and an abstract rope-like design that wended its way across sweatshirts. The women wore sock booties and several carried bags that featured a centurion's helmet, one of the few images in this largely monochromatic collection of white, cream, black and grey. The proliferation of stripes and general nautical feel was a clear indicator that this was a Spring collection: in keeping with the House's new ethos, pieces from the collection were immediately available for purchase after the show. Antonio Berardi's clothes for Autumn 2017 had Elizabethan references although Shakespeare's Lady Macbeth - albeit updated for the times - was the stated inspiration. The clothes were fairly complicated. Both jackets and trousers sported peplums (pepla?) and Berardi combined technical fabrics and drawstrings as design elements as well as fasteners. Bermudian designer Meagan Wellman launched the Spring/Summer 2017 collection for her line M_SEW yesterday. Consisting of around 12 pieces, the collection was inspired by 1970s Jamaican sound system culture and the waters that surround the island. 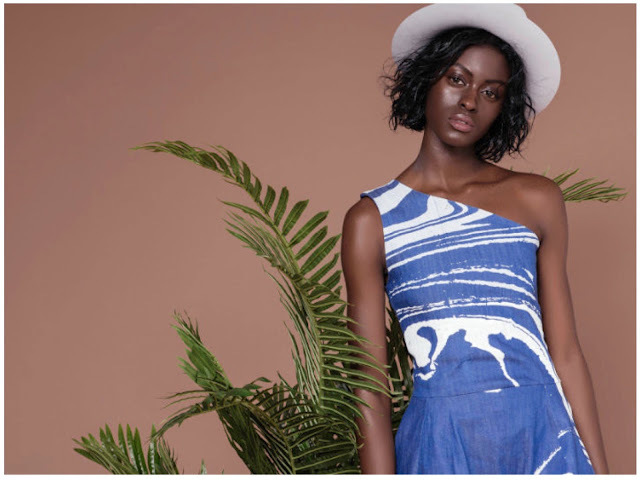 Entitled 'Sound Waves', it is Wellman's take on that era and builds upon her previous 'Cup Match Runnings' collection with more sportswear elements and references to vintage swimwear. The pieces, with the exception of the jumpsuit, consist of separates which allows the wearer to put their own stamp on the clothes and create a unique look. The collection includes a bikini bra pleated top with peplum, high-waisted flared leggings, a halter-neck top and several cold shoulder pieces. Wellman uses spandex, a textile commonly found in swimwear, and incorporates features such as adjustable straps and tie fastenings to ensure optimal fit and comfort. Cotton French ticking, more often used for upholstery and white cotton open weave fabric used for cross-stitching have also been incorporated in new ways. The collection is unified by an original screen-printed marble pattern that ensures these classic fabrics are imbued with new life. 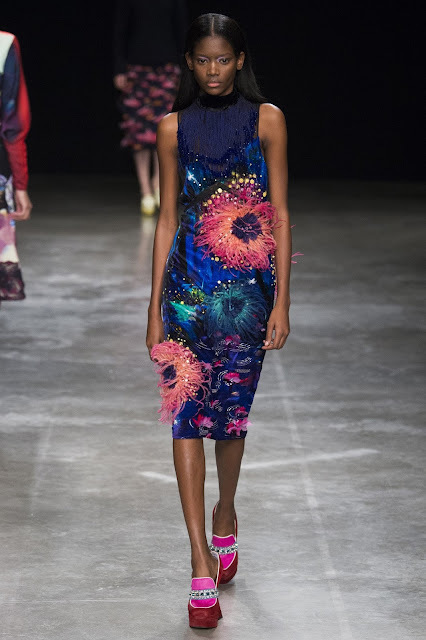 Lush, rich fabrics from Erdem who showed show-stoppingly beautiful dresses that were a nod to his heritage. Like David Koma and Anya Hindmarch, Erdem looked to traditional folk costumes for his inspiration. Here, the cultures of England and Turkey were combined and the resulting clothes were conservative for the most part offering the rare glimpse of skin. Velvet was used quite a bit showing up as skirts, dresses and coats. 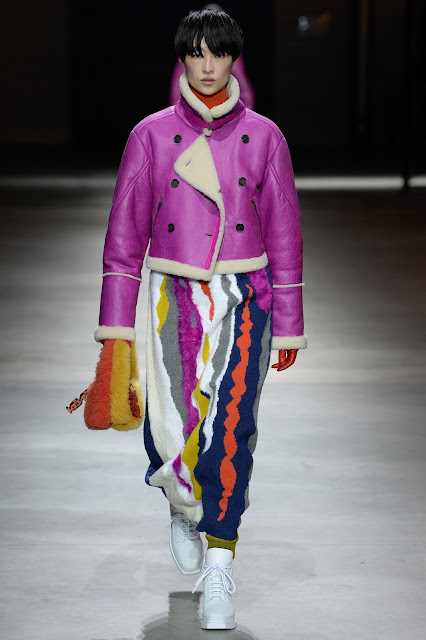 Markus Lupfer showed one of our favourite collections of London Fashion Week thus far. 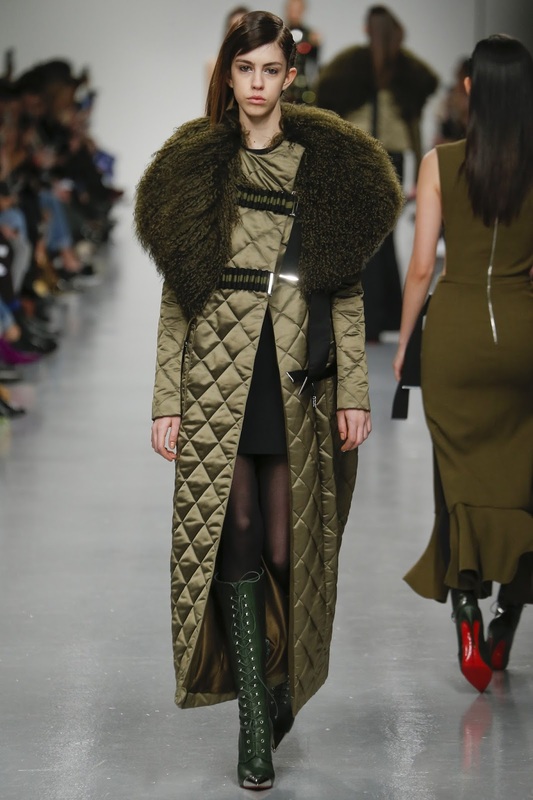 There was a lot to parse in every look: belts fashioned out of braided hiking cord, leggings with side stripes layered under skirts and sloping-shouldered coats with crystal embellishment on their sleeves. The collection took its cue from menswear with the use of suiting, and athleticism was also key but, despite this, the clothes remained undeniably feminine. The Arctic seems to be on everyone's minds this season perhaps due to the increased awareness of the effects of global warming, and Lupfer's prints like Anya Hindmarch's, included polar bears and, as was also seen at Thom Brown's show, penguins. 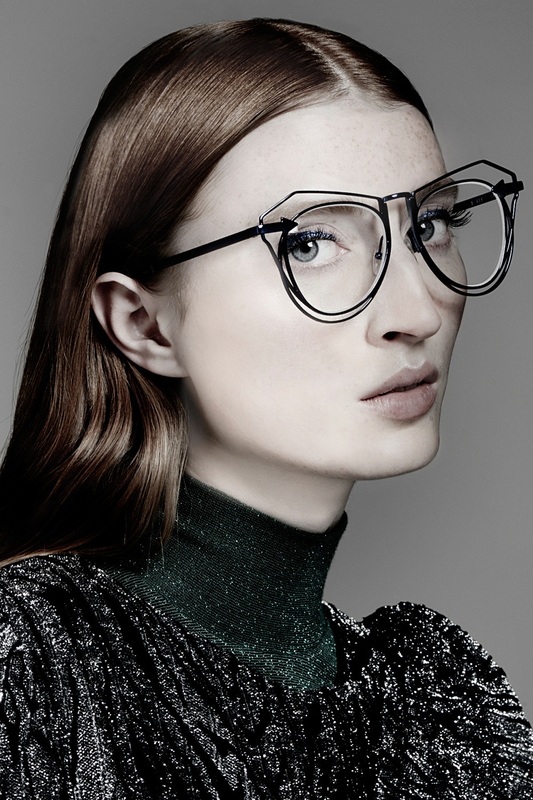 A militaristic collection from David Koma. Belts and fasteners were strung across the models' bodies like ammunition-filled bandoliers. Quilted bodices, jackets and coats were paired with asymmetrical skirts and luxe llama fur trim on skirts and collars showed up once again (we're sensing a trend). The clothes were mainly army green, royal blue and white all grounded in black and Koma also used lace reminiscent of camouflage in black or metallic green to highlight some of the dresses and suits. In a season rife with whimsy and overt femininity, Koma's collection brings much needed structure, minimalism and clarity to the runway. Fairies fly amongst the flowers in this whimsical collection from Mary Katrantzou. The first half of the show started off fairly sedately with check and floral separates quite inventively combined and beautifully embellished coats with fur collars, but the show quickly devolved into something more fanciful. From oversized fur coats with exaggerated shoulders and velvet trousers, it all culminated in a series of dresses with scenes created in Swarovski crystal beads and fringe that brought the Disney classic 'Fantasia' to life. 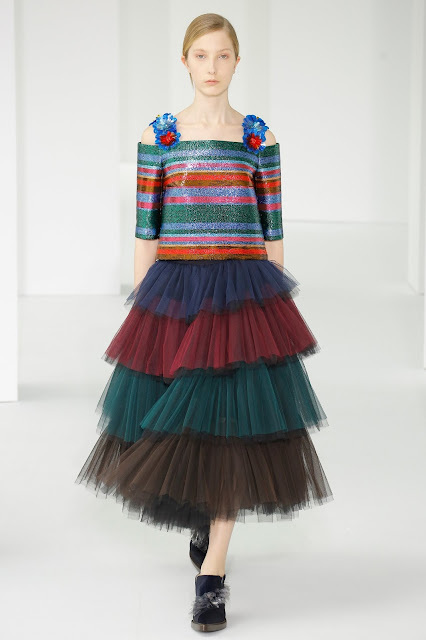 We're not completely sold on the juvenile theme, but Katrantzou certainly created a contemporary Cinderella story with this collection. Anya Hindmarch is hot for hygge this season and looks completely taken with all things Scandinavian. Her inspiration was Swedish folk art and this showed up in a stylised and simplified version as leather patches on wool and felt coats (some with impractical cut-out shoulders) and bag straps. Fur and shearling abounded from head to toe and showed up as stoles, collars, hats and on shoes, often in bright colours. Sensible, but covetable, sandals and clogs were paired with thick, woollen socks to ensure that toes will be kept warm this autumn. Most pieces hit well above the knee including large bloomers that were paired with chunky knits and knitted rompers. We loved the colours: not quite pastels, but a more modern take on blues, teals, rust and pink. We've written about Lisa Perry's 1960s aesthetic before and it's evident again here with the simple lines of the dresses she showed for fall. The small collection also featured an abstract print and playful graphics in primary colours that were inspired by Joan Miró. Nili Lotan takes another look at suiting and separates with this collection. We love the double-wide trousers and jeans which were paired with chunky knits or cozy jackets. All the usual tropes were present and correct at Delpozo including voluminous silhouettes, colour-blocking and embellishment, although the use of latter was more restrained than usual reflecting perhaps a diminution of the ebullience that has characterised previous collections. This time embossed jacquard, silk lamé and floral organza added a subtle shine. Bell-shaped, petal-like sleeves stopped above the wrist and folded on themselves like origami. The autumnal colours were inspired by Nabi painter József Rippl-Rónai and were used to good effect on striped sweaters with hoods that were paired with petal-shaped skirts or evening wear. Long, clean lines in subdued colours from Narciso Rodriguez that included high-cropped and flared trousers, and dresses that hit the leg at about the same spot. Clothes were slit up the sides and across the chest giving glimpses of skin. The vertical lines of the calf-length coats, cardigans, skirts and trousers were broken by horizontal banding. We loved the sheer, layered blouses and the cape-like top and dress with elongated, slit sleeves. As Jack McCollough and Lazaro Hernandez prepare to bid farewell to New York Fashion Week, they showed a collection of complicated clothes covered in abstract and amorphous scribbles and swirls and graffiti-like prints. Key pieces included shiny, lacquered leather trench coats and sheath dresses, cosy shearlings and layered technical knits. Asymmetry was a recurring theme with many items featuring sleeves of different lengths, uneven hems or cutouts on one hip. Clothes wrapped around the body held by extra long belts secured by d-rings, while bracelets wound sinuously around wrists and arms. Fasteners - zippers or buttons - were also skewed off-centre and became a design element. A quietly elegant collection from Elizabeth and James featuring minimalist, sophisticated clothes in a limited colour palette of black, white, grey, red and cream. The innately wearable collection focused on luxurious materials which were allowed to take the forefront without too many fripperies or unnecessary additions. With all the recent upheaval at this house, expectations for this debut collection from Monse's Laura Kim and Fernando Garcia were high. The result was a fairly safe but well thought out collection that pulled from the archives and was high on glamour. Kim and Garcia showed structured tops and dresses, rounded shoulders and oversized florals. We'll be the first to admit that we consider the lustre of the Kate Spade brand to have faded since the departure of its eponymous founder some years ago. Since then, the house has seemed to play it safe, unwilling to step outside the niche it had found for itself in the market. That cautious strategy has resulted in something of a stagnation in the line and a predicability in its offerings. So we were happy to see a slight course-correction for Fall 2017. A little more edgy than usual, gone are the pastels (although a pale pink outfit does turn up at one point) replaced instead by red and black. The print is still floral, but the sweetness of the poppies are offset by the black background and the use of animal print. Of course the line's lifeblood - accessories - feature heavily. Fashion seems dark and sombre this season and this is reflected by yet another mainly monochromatic collection, this time from Milly, usually a preppy and optimistic house. Designer Michelle Smith played with proportion and deconstruction: shapes were long and skewed or cropped, shirts and dresses were turned back-to-front and held together at unconventional angles and sleeves slashed at the shoulders or extended past wrists, puffed and exaggerated. The only relief came from the use of a few metallics: gold and copper and silver and some texture by way of feathers. So many designers have decided this season - for whatever reason - to show their collection as a presentation rather than on the runway. In general, we don't have a problem with this choice, but this time around, many of the chosen locations have been noticeably high on 'atmosphere' and low on lighting which makes the clothes hard to photograph and do them little justice. Case in point, the presentation put on by Jill Stuart whose beautiful clothes could have benefitted both from better lighting and the movement models strutting down a runway could have provided. In any event, her collection, largely in black and gold, was a lot of look featuring intricate, lacy and overwrought pieces often in the same outfit. The clothes were unabashedly feminine with frills and florals all combined in unusual ways. Kenzo showed beautiful oversized parkas that were layered and flounced, cinched at the waist with drawstrings and ties. The waist was a recurring feature with wide banding and belts used to emphasise that part of the body, giving an obi-esque feel. Warm shearling jackets and even skirts in rich colours such as chartreuse, pale blue, black and white provided warmth and texture and even more texture came from their use of plaid which in some cases were woven and ended in fringe and ribbons. We thought the badges that featured scenes of tropical landscapes were an ironic touch. Wish you were there? It seems like New York Fashion Week has started out more slowly than usual, with the number of noteworthy collections yet to gain momentum. 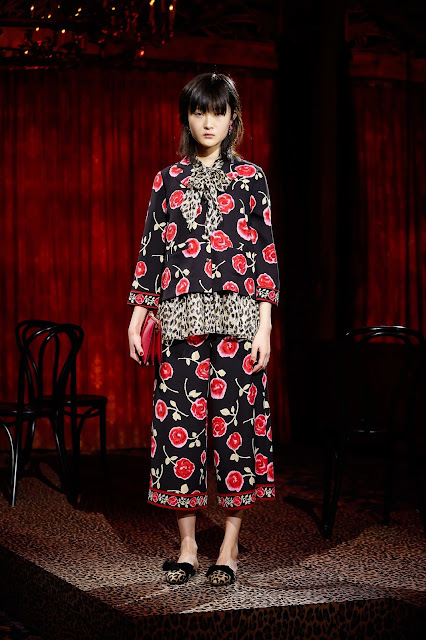 While we wait, let's kick off our coverage with a look at Red Valentino's presentation which was all about feminine folklore, a theme that has reoccurred quite often over the last few days. 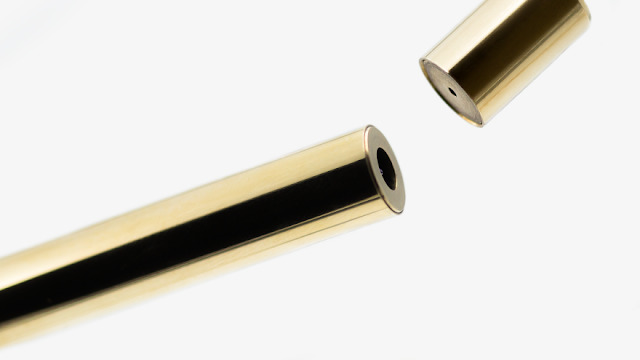 The Quotidian Pen is a ballpoint pen prototype that features a magnetic propulsion mechanism created with the use of neodymium magnets whereby the nib of the pen is only extended once the cap is placed on the end. The pen is designed to be fiddled with and is carefully centre-weighted to provide an effortless, yet premium, writing experience. It is made from aircraft-grade aluminium that has been coated to create a high gloss surface and solid brass which is designed to change to a natural patina over time. Because of Bermuda's one-car-per-household law, scooters and bikes are extremely popular. 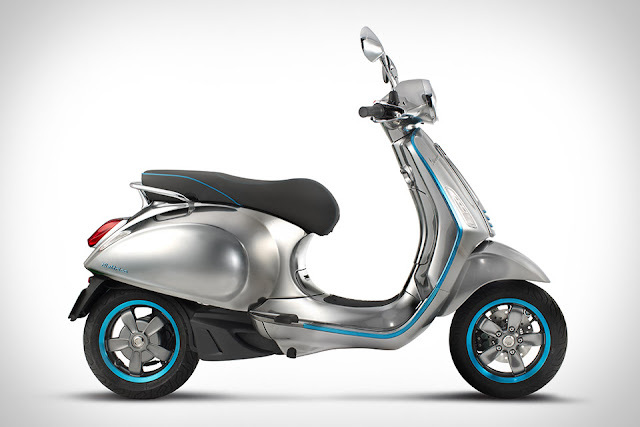 Couple that with a population that is becoming increasingly aware of the effects of pollution on health and the environment, and this the Elettrica Electric Scooter from Vespa begins to look more and more welcome. The Elettrica promises to bring all-electric mobility to the streets using the latest technology all the while maintaining the style, handling and ease of use of the original scooter. The Elettrica will be launched in the second half of 2017. 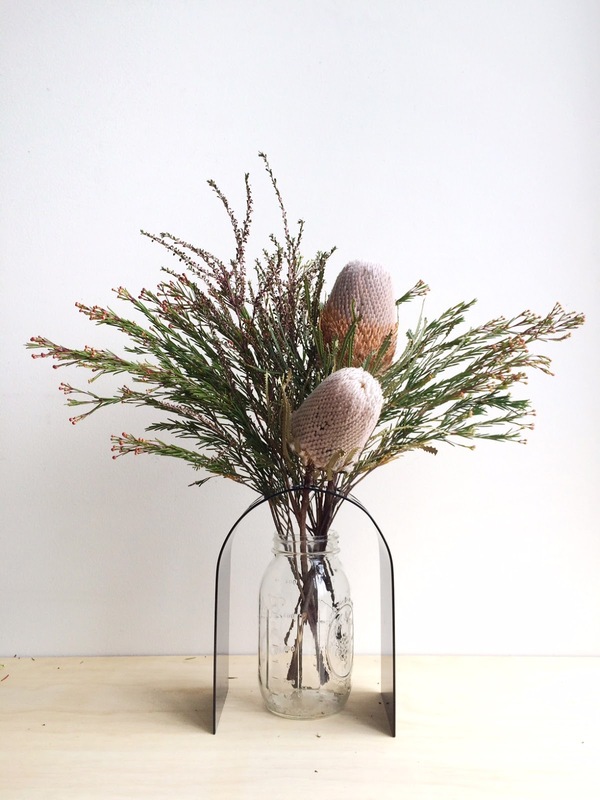 Repurpose your old jars with the HOME Vase from Rainy Sunday and turn any jar or canister into floral art. A perforated curved steel frame is designed to hold flower stems in place and can be used with a few sprigs or an all-out flamboyant arrangement of blooms. The HOME Vase is powder coated and is available in Smoke Blue, Yellow, Pistachio, Black and Cream. We love the subtle palette of the Lotta Agaton for H&M home kids collaboration which is based around black, white and pale pink. The Swedish interior stylist used simple shapes, batman and masked rabbit graphics to create a Halloween kids' party. 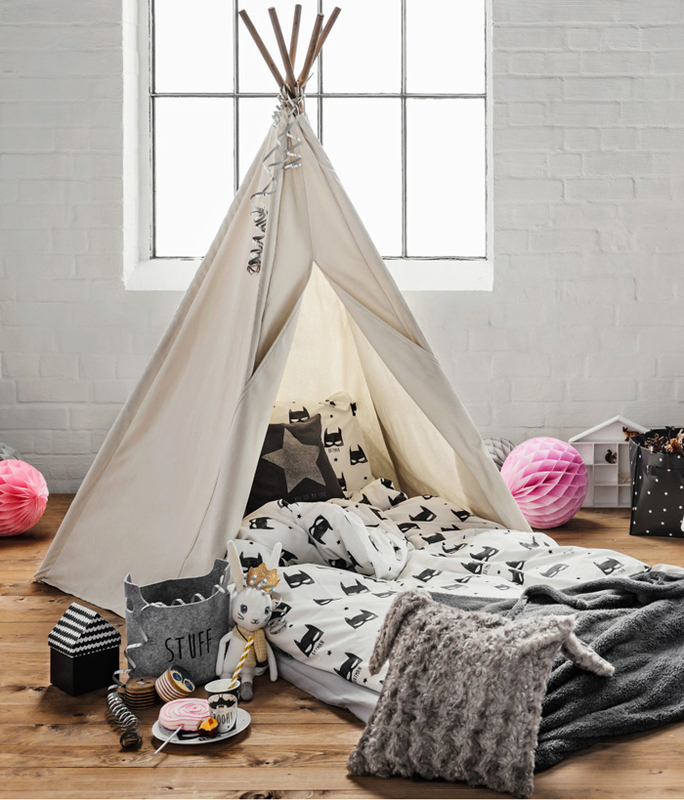 The collection features rugs, bedding and storage items. 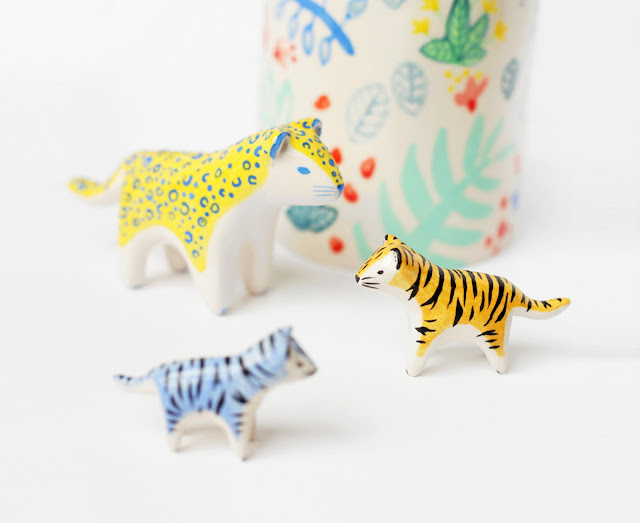 These sweet ceramic animals from Dodo Toucan are individually handcrafted in Paris by designer Sara Theron. Karen Walker has updated four styles of her iconic frames by rendering them in wire. The frames come with clear placeholder lenses but can be fitted with prescription or tinted lenses.